This the last episode in the Il Costruttore trilogy, would like to introduce you to: the Maserati 25OF of Tony Dennis, which is without argument the finest scale replica available! Now hailed as the un-crowned king of model builders - not bad considering that he has completed just two models so far. Tony, now aged 53 and formally a qualified production engineer in the aeronautical industry, turned to modelling after having been made redundant four times in as many years, now builds his scale replicas full time, at his home in Upper Beeding, West Sussex. The detailed radiator of the 250F. He has been building models of one sort or another since his childhood, but it's only in the past few years that he has concentrated on building large scale scratch-built racing cars. "For many years I specialised in building 1:43rd scale cars for a dealer as well as building the much larger 'Wills Finecasts' and 'Pochers' for friends and friends of friends. Having had some success with the large scale 'Pochers', I then decided to have a go at scatch-building a Healey 3000, as a personal test of my own abilities" this replica was subsequently sold at Brooks the Auctioneers for £2,500. When I asked what had prompted him to build a 250F, he replied "That it happened purely by chance, I took the completed model of the Healey 3000 to restorers 'Crosthwaite and Gardner' who specialise in them, to get some feedback. In conversation I made a passing remark that I actually wanted to try my hand at modelling some Fl cars. It was then, that they suggested I contacted the owner of a Maserati 250F, and that's how I ended ended up making a replica of chassis 2507. In the interim a Belgian gentleman, collector of models and Aston Martins, heard of my endevour and commissioned me to build another." The chrome wire wheels - note the fined drum brakes through the spokes. Tony's first customer and owner of 2507 remarked "That the difference with Tony is that he is an engineer by profession not a model-maker. He is therefore unable to take their short cuts, I don't know of anyone else who could build a model to this level of detail. The value in pounds is an irrelevance to me, it sits in my office and reminds me of driving the real car, and of those who drove the 25OF in its heyday. If Tony wasn't building a model for someone else he would be building another one for me." Praise indeed! The detailed finned and ventilated drum brakes of the 250F. 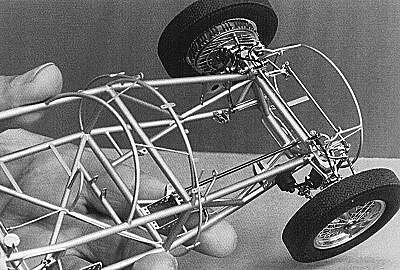 When I enquired as to what had prompted the use of the somewhat unorthodox 1:13th scale, Tony replied, that "When I scaled back from the original chassis tubing, one eigth of an inch tube was within a few thou at 1:13th. scale" simple, nothing complicated, just attention to detail! "Each model is unique - I make everything, including every nut and bolt, there's no plastic components, very little glue and definitely nothing available off-the-shelf used." He turns, moulds, machines and individually fabricates everything from raw materials; Brass, Copper, Silver, Steel, Aluminium, Wire, Rubber and Leather, using an array of both industrial and customised precision tools, more commonly to be found in a dental lab or jeweller's workshop, to produce the 4,000 or so, mechanically conected individual components necessary to build one 250F, just like the full sized version. Tony's hand gives you some idea of its size! 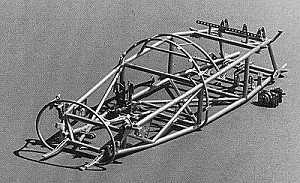 Take for instance the chassis - the one eigth of an inch brass tube used in preference to rod, Tony has to import from Switzerland. Detailing of the space-frame is so intricate that it makes other large scale 25OFs look as though their chassis are fabricated from scaffold tube. 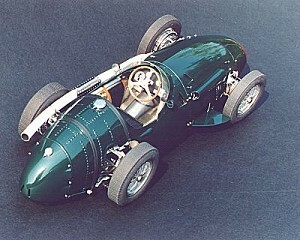 A total of 200 individual pieces of tube go to make up the chassis of the 250F, all as per the original. Meticulous attention to detail ensures that everything is exact and where it should be. In the cockpit - the leather seat, the machine turned dash, the minute instruments, the mirrors, the wood rimmed riveted steering wheel, the pedals, nothing has escaped his obsessive attention to detail. Every part is individually made to scale. Unbelievable! The engines are superbly crafted with all the necessary plumbing and wiring, radiators being fabricated with real cores, exhaust systems built from hollow tubing, each pipe individually hand formed as per the full size system. Suspension legs, shocks absorbers, wheels and tyres are all individually made for each car. 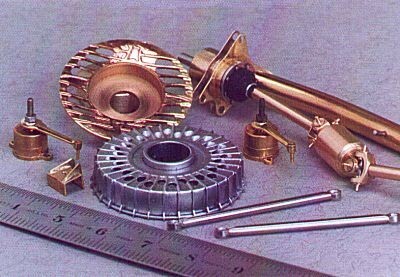 Of all the components used in the entire car Tony admits to there being only one casting, which is used three times - the carburettor body. As I said at the start of this article, Tony has completed only two cars to date but he has built four engines. Why four? I hear you ask! 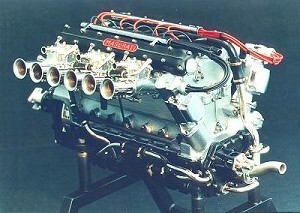 The clients for whom the cars were built were so impressed with the level of detail that they ordered spare engines which could then be displayed separately on a 'Dennis' custom built stillage. The accurate tubular chassis of the 250F. I couldn't help but notice the tyres, when I mentioned them, Tony went on to say that "they are individually moulded complete with authentic tread pattern and 'Dunlop Racing' in relief on the sidewalls, I use a synthetic cold-curing silicone rubber to form the actual tyre, but first I had to make the moulds and that took weeks of work, reproducing the tread pattern was a nightmare." "My ambition from the start, was to build a fully engineered model which I think I just may have achieved." The result of these humble endeavours is a car with working suspension, gear and throttle linkages, steering and pedals, transaxle, differential etc. The steering box, is in fact so accurate, that the wheels turn at the same ratio as that of the real car, whilst the De Dion tube slides up and down in the transaxle. 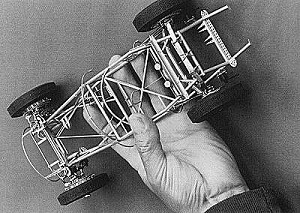 Pick the replica up (if you dare) and it comes alive in your hand; the suspension drops, the steering linkages and wheels move and settle - all as it should be. The rear axle and half-shafts. The consequence of these labours is that each car constructed ends up being an individual replica of the original. No matter from which angle, this masterpiece is viewed, you see modelling perfection, accuracy and meticulous attention to detail in every respects. Even the engine bares a tiny plate inscribed with the real cars chassis number. 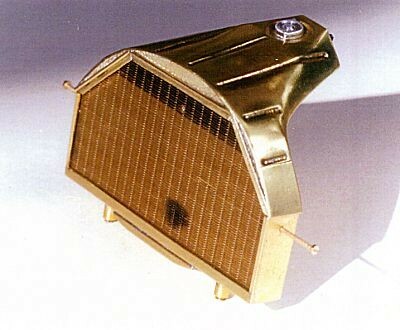 Finishing also gets the 'Dennis' treatment, the body panels being formed from sheet copper dressed over wooden bucks, which Tony made, then silver soldered and fixed with miniscule rivets before being electroplated to simulate their correct finish. Even the cam covers on the engine block are black chromium plated, rather than just finished with satin black paint. 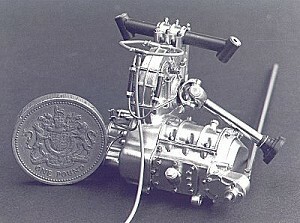 The 2.5-litre engine in Tony's model. Tony pointed out, in all humility, that his masterpiece was however flawed, there was an error - "the wheel spokes are not tapered as they should be, a fact of which I'm not proud. but when I was considering how this could be achieved on a piece of metal twelve thousanths of an inch thick, I was stumped - my ingenuity had for once failed me! I don't think anyone will notice do you?" Not without an electron microscope - I don't! Just trying to describe this replica, given the exacting level detail to which it has been constructed is an impossible task, it has to be seen in the flesh, to be fully appreciated. The more you look - the more you see! It is without doubt the very best available, anywhere, at any price! Yes, this is a model. Just look at those pedals! It has even been described by persons more knowledgable in these matters, than myself as "overshadowing the works of such giants as Bosica, Conti and Wingrove." 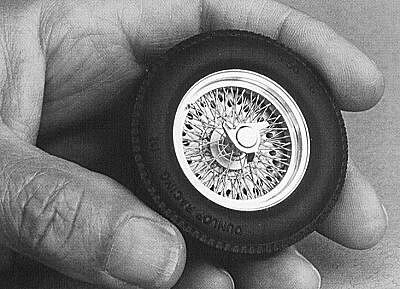 With his 250F, Tony has taken model making into a completely new dimension, that of an 'Artform' - It really is that good! These scale replicas, are however strictly for the serious and 'Well-Heeled' collector. They bare no resemblance whatsoever to anything seen before, they are totally exclusive, individually hand built, each model taking over 4,000 hours to construct. This kind of exclusivity is definetly not for the faint hearted, if you want one, be prepared to pay in the region of £30,000, yes that's That's what I said, £30,000! When I first saw these phtographs, I thought it was a real car. 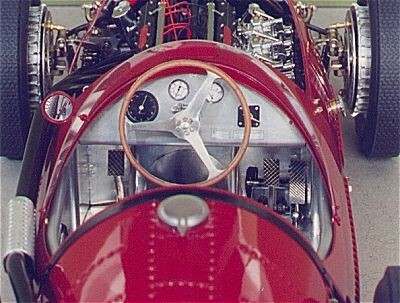 The Tipo 250F is the car which made Maserati a Grand Prix legend and is often referred to as the greatest Formula 1 car ever to be built. If you aspire to owning one but are short of the odd £1,000,000 required, then there is a slightly more realistic option available for the armchair Fangio, to indulge your fantasy, at a fraction of the cost. 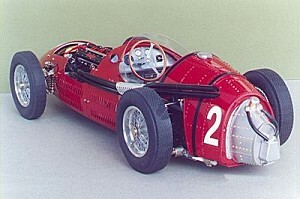 The model of the 250F displayed at the Modellismo Maserati Exhibition. Tony's final and rather poignant comment was: "The thought that my miniature replica is a small reflection of the craftsmanship, skill and ingenuity of the people who built the full sized originals. The cars that were driven by 'Legends' the likes of; Fangio, Musso, Behra and Moss is in effect my tribute to the unsung heroes of yesteryear. These are the thoughts that are with me when I'm alone in my workshop - I hope that my humble efforts do their memory justice." Today Tony is busy working on a Maserati Tipo 8CTF and I understand that we should see the finished article in two years time. I am sure the owner can't wait!